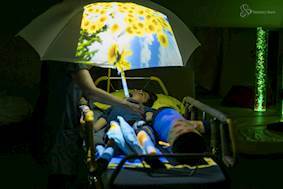 Challenge: To create a fully integrated and accessible plug-and-play mobile Magic Carpet interactive projection system, offering variable image size and easy set up and control to stimulate and engage people of all ages and abilities. 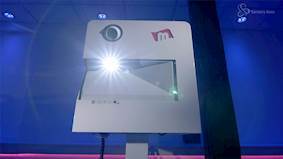 Solution: Sensory Guru partnered with Loxit Ltd, to develop a height adjustable projection system that can be controlled using a smartphone or tablet app and features the Optoma X320UST ultra short throw projector. Results: More than 500 UK schools, centres and hospitals have now adopted the Magic Carpet either as a fixed ceiling installation or a portable system. 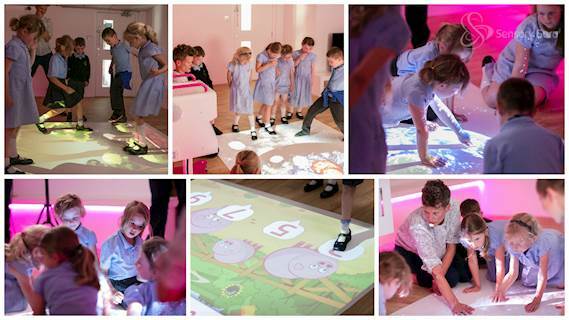 It is the only NHS-approved interactive floor projection system and is now on the NHS framework for Sensory Equipment. 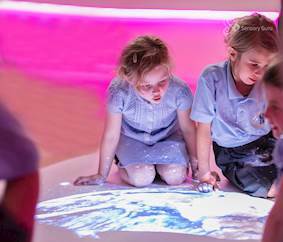 The Magic Carpet responds to the slightest movement, supports multiple access methods such as gesture, eye gaze, mouse and touch and projects a variable image size, up to a huge 3.6 metres wide, catering for wheelchair accessibility. Sensory Guru has been supplying the Magic Carpet system as a fixed ceiling installation since 2009 but wanted to create a fully integrated and accessible plug-and-play mobile Magic Carpet interactive projection system that allowed variable image sizes and easy set up and control. The Magic Carpet is an app-based interactive projection system that stimulates and engages people of all ages and abilities. Users simply move over the projected apps to interact with them. It has a motion capture camera that tracks users as they move over the projected apps. This movement data informs the software of the speed, direction and location of the movement. The software then converts this data into dynamic audio-visual feedback, which users experience as real-time cause and effect triggered by their movements. The new unit had to be small and light enough for users to be able to move it around a school or centre with ease and take up minimal storage space. An earlier mobile projection system prototype emulated the fixed overhead projector configuration which meant it was tall, bulky and not easily portable. Sensory Guru was determined that the design aesthetic of the new unit should be appealing to customers and had to be easy to operate and secure - with all cabling hidden. It had to be adequately proportioned for the motion tracking camera to see the full projected image for calibration purposes and be height adjustable to vary the projected image size. This aspect was hugely important as many users would access the system from a wheelchair. It needed to project a fully formed image onto a wheelchair tray when used by a single user, as well as offering a huge 3.6 metre wide image onto the floor when used by groups. And it needed an ultra short throw projector that delivered on quality and brightness. Sensory Guru contacted the AV fixing solution experts at Loxit Ltd and together developed designs for a new portable unit. After a year experimenting with camera and projector configurations to find the perfect combination, the team chose the Optoma X320UST ultra short throw projector. Lee said: “We needed the image to be bright. The focus had to be manual and accessible while the projector was mounted in the frame and we needed the projector to have rear fix cabling. At 4,000 lumens the X320UST is one of the brightest ultra-short throw projectors on the market. Its ultra-short throw lens can project a 100 inch image (diagonal) from just 55cm from the screen, wall or floor. This Full 3D projector comes with a built-in speaker that delivers powerful 16W audio. An audio output is also included, enabling connection to external sound systems. It has a range of input options, including two HDMI inputs and two VGA inputs, making switching between sources simply the push of a button and can be controlled and monitored remotely over a network via RJ45. The self-contained Magic Carpet was developed with innovative new software including 500 apps arranged into 25 easily navigable categories as well as 35 customisable app templates. 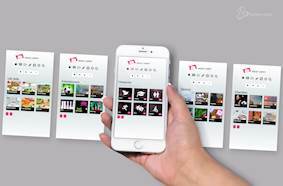 It has 5,000 media assets for learning activities, group apps and an intuitive Master App Builder. This allows users to create content from their own images and make apps within minutes. Control is via from Sensory Guru’s iOS and Android apps which include a remote system shutdown. The Magic Carpet is fully compatible with Tobii Dynavox eye trackers which can be used on a monitor alongside the Magic Carpet to enable Eye Gaze users to participate with their peers. The Mobile Magic Carpet was launched at this year’s Gadget Show Live. Since then the system has received great feedback and been featured on BBC news, Sky News’ Swipe Tech Show and other media. More than 500 UK schools, centres and hospitals have adopted the Magic Carpet either as a fixed ceiling installation or a portable system with the variable image size up to a huge 3.6m wide. A number of units have also been donated to UK Children’s Hospices by the charity Lifelites. 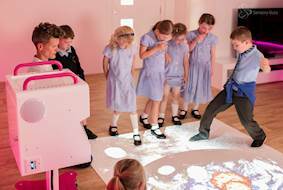 Magic Carpet is the only NHS approved interactive floor projection system and is on the NHS framework for Sensory Equipment. It is the only interactive projection system that allows users of different ages and abilities to play and learn together. The Magic Carpet responds to the slightest movement and supports multiple access methods such as gesture, eye gaze, mouse and touch. The Magic carpet supports national curriculum Early Years, Primary and SEN learning, sensory stimulation, play and leisure with a wide array of interactive content. With its eye tracking technology and its ability to focus the image onto a wheelchair tray, it is particularly beneficial for disabled users. Loxit Ltd design and manufacture security and mounting products for the ICT and AV Industries.